Anyway, I was thrilled when I found this entire kit. It's a 4 wheel drive car chassis, and I quite liked the style as well. 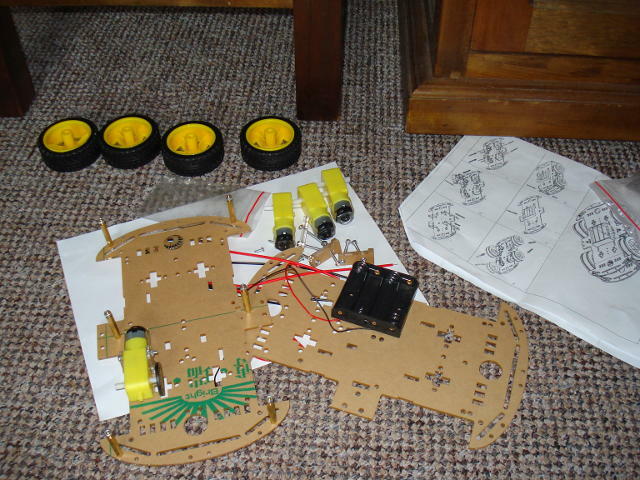 The kit contains 4 geared motors, wheels, and a chassis in clear plastic. It arrived the day; first class service from chemilia0902 on EBay (UK). Hope he enjoys the plug; I'm not affiliated in any way, I just really appreciate speedy service. 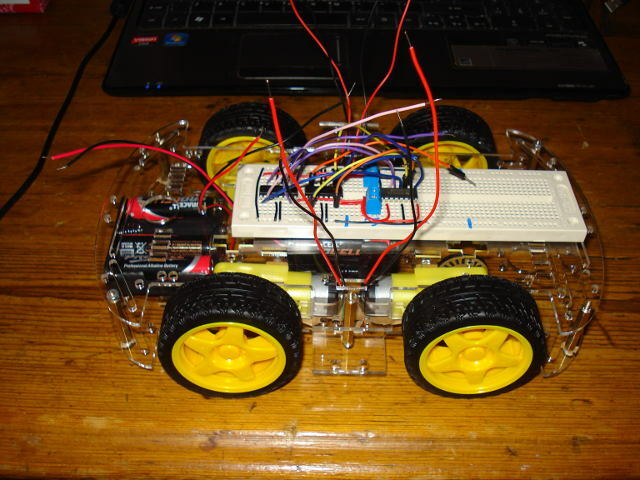 My 4WD car chassis kit. The chassis has the protecting layer on at the mo. 4 motors, one already fixed in. 4 wheels. There's also another 'wheel' to attach inside the chassis, that you can just see. I think it can be used for measuring distance. More on that later. 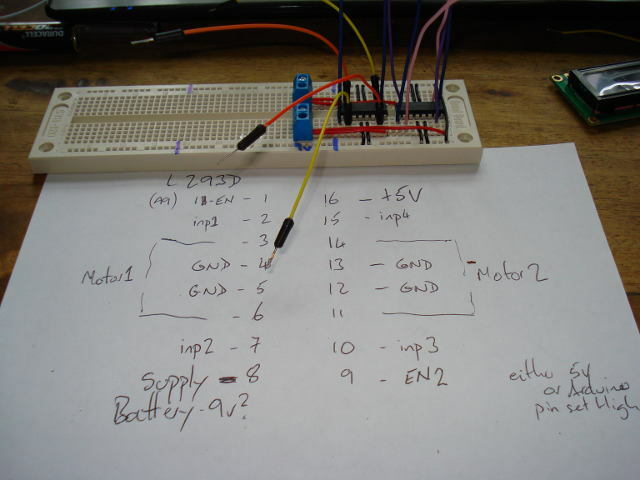 The motors are DC; wonder can I replace them in the future with stepping motors ? Probable sensors; compass. wifi or wireless. remote control unit. Ultrasonic distance (for obstructions). A lot of fun code for all this ! Planning the locations of the battery pack (lower chassis) and electronics (upper). Note that wheel, bottom right of the pic, inside the chassis. Distance measurement device ? Upper chassis fits on. Have forgotten to remove the brown paper protective covering ! 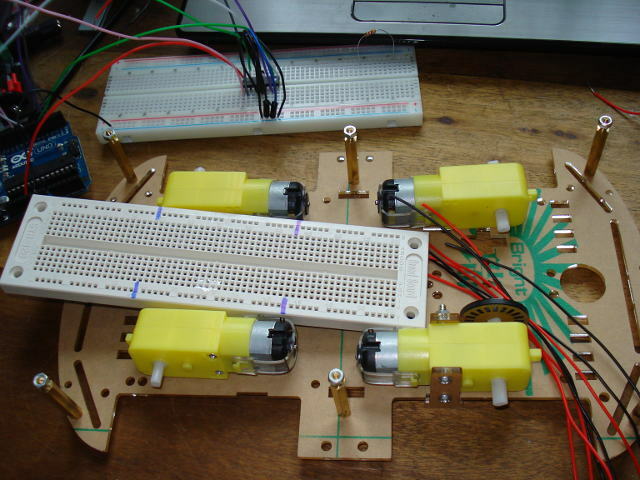 After a lot of wiring; a shift register is unused at the moment. Wired up and working with the code below. 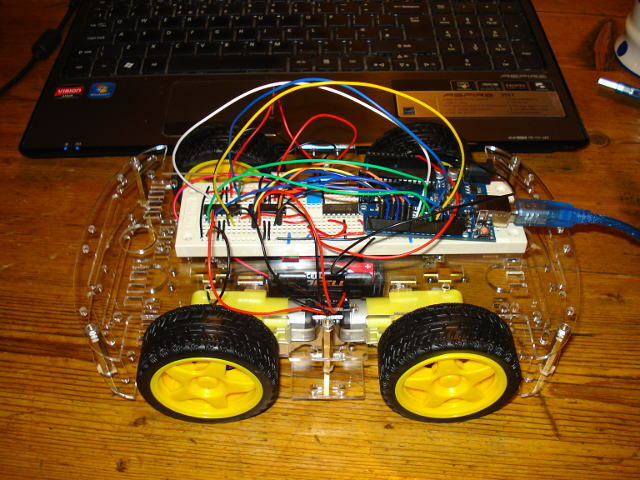 It's still using the main arduino, and the USB cable for +5V power for the circuit. 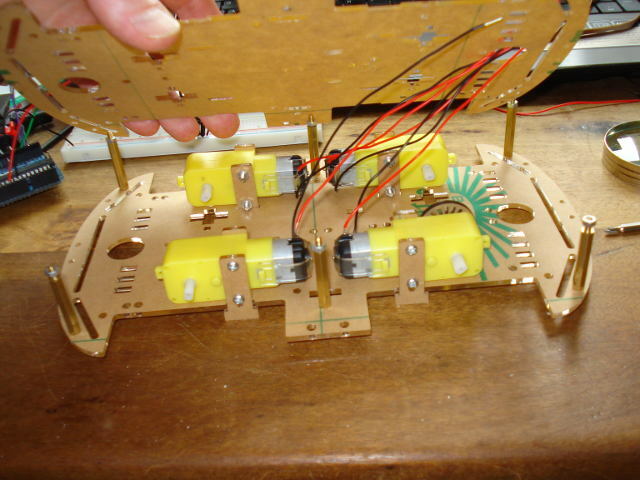 The motors are driven by the 9V battery pack below. Clearly this code, which is based on a tutorial, needs to be rewritten as the next step, and then I can start to test turning corners.